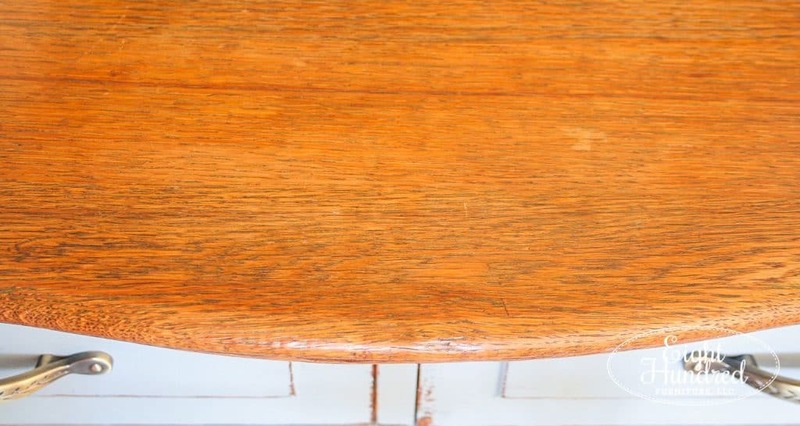 I snagged a beautiful oak dresser with a serpentine top from the auction last week. It was a bit wobbly and was pretty dirty inside, but those issues don’t scare me! You can’t imagine how many spiders, cobwebs, dead insects, nests, dirt, trash, etc. I’ve cleaned out of furniture. Nothing really surprises me anymore. I was a bit stumped on how to stage this because I didn’t have the types of pieces I wanted. My large ironstone pitcher is currently displaying my German ostrich feather dusters in my booth at Morgantown Market, so I had to come up with a different plan. Whenever I’m stumped on staging, I just Google pictures for ideas. I found this one that Marian Parsons of Miss Mustard Seed staged and tried to replicate her ideas. 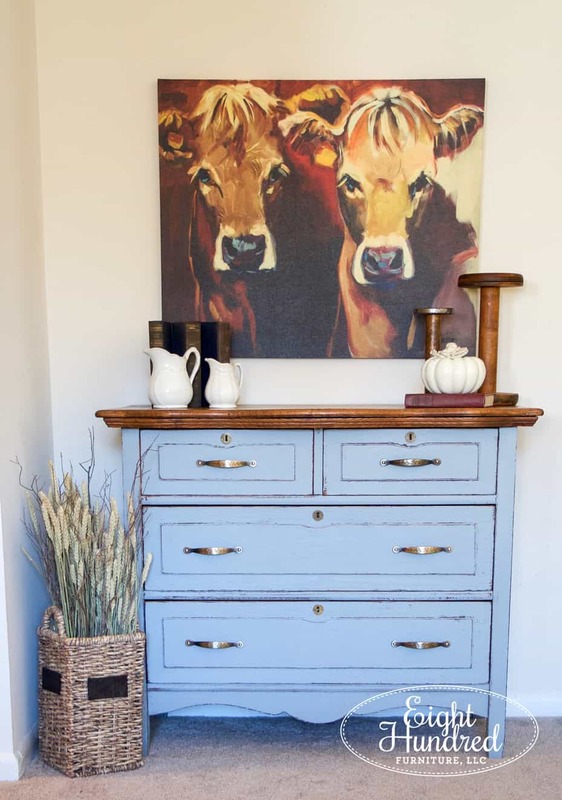 I had old books, a few ironstone pitchers, and a painting of some cows! What do you think? 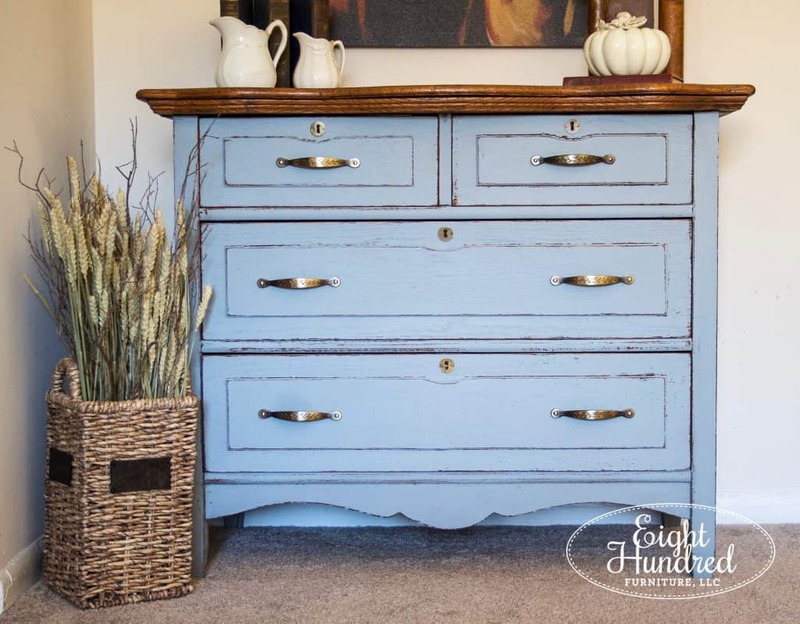 This dresser is one of my favorite pieces I’ve painted. I love everything about it – the shape, the color, the distressing. I went down to my local Ace Hardware and snagged some new handles. The original handles were Chippendale style, which is definitely not my favorite. 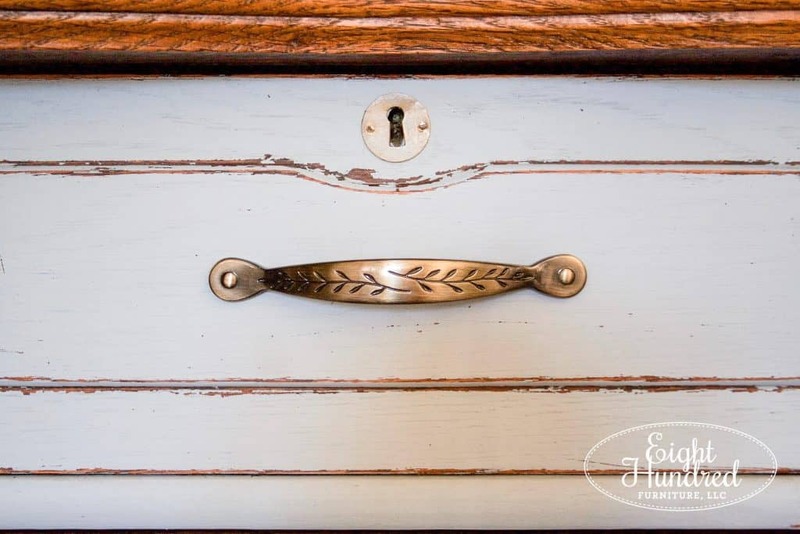 I thought these gave the dresser a feminine touch with the leaf pattern flowing across the top. 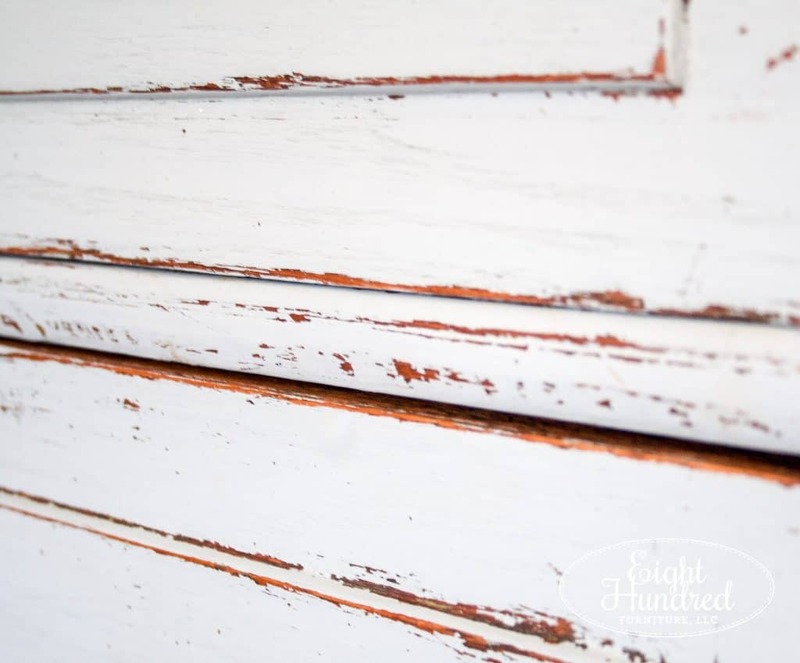 The milk paint distressed perfectly. I hit the edges and some of the sides with a piece of 100 grit sandpaper. I used a heavier hand than I usually do when I distress, but I knew this piece could pull it off. I tried to loosely copy Marian’s staging and put my own twist on everything. 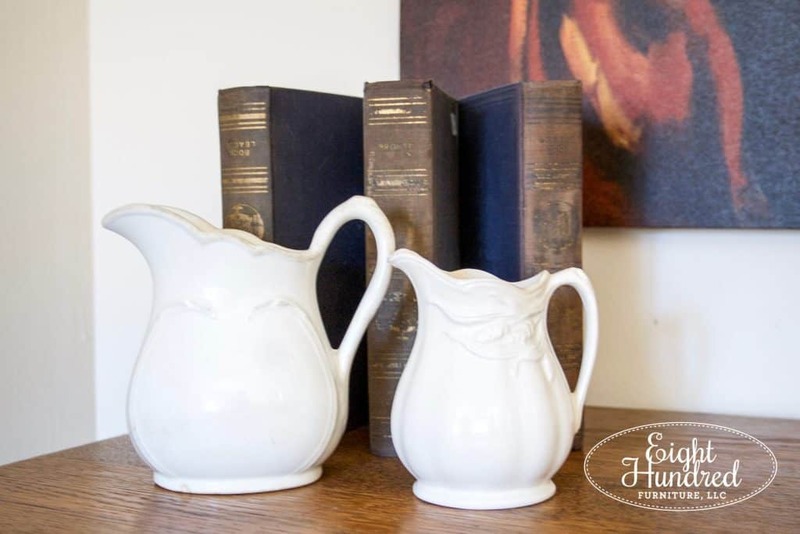 I fanned out my set of classic books and used them as a backdrop for my two pretty ironstone pitchers. 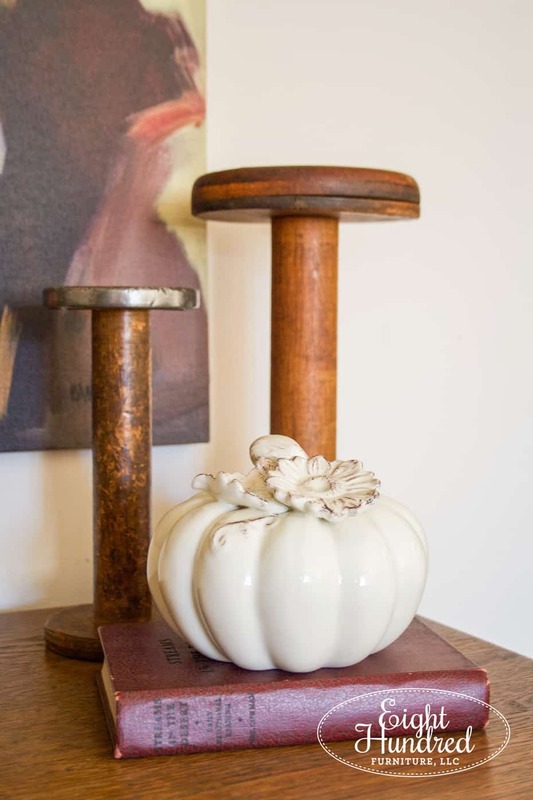 My trusty wooden spools, a ceramic pumpkin, and another old book adorn the other side. 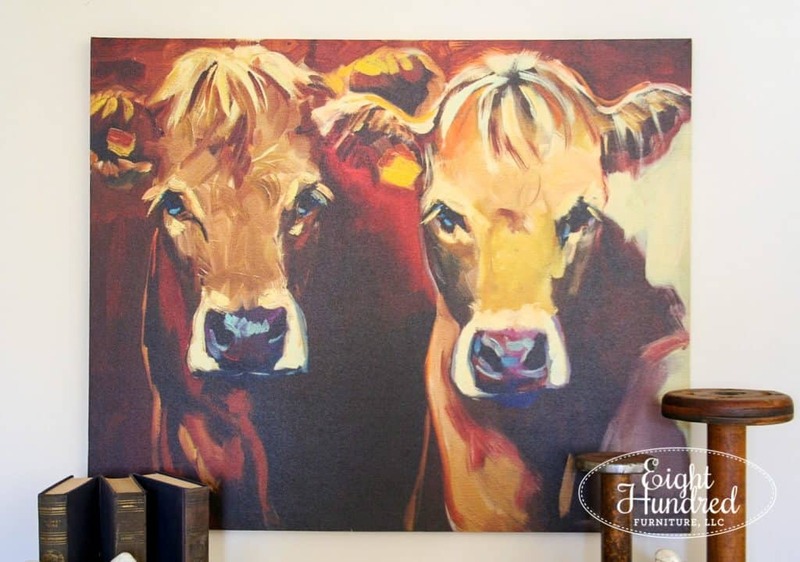 On the wall, I hung my FAVORITE COW PAINTING EVER! It’s not an original, but it was in my budget and I had to snag it when I saw it at Fresh Vintage by Amy in Strasburg. 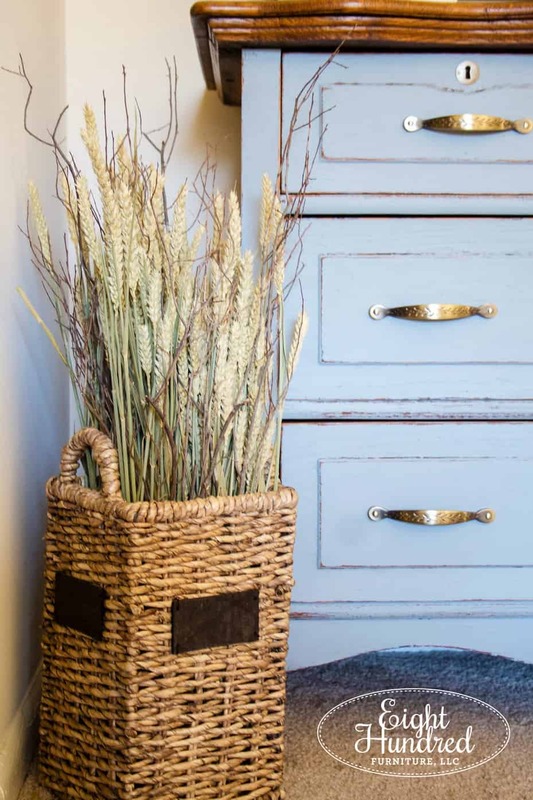 The store has changed ownership and is now operating under the name Blue Dandelion by Tiffany. It’s just as adorable and if you’re in the area, you should visit! Just look at their little cow eyes! Don’t they just melt your heart? 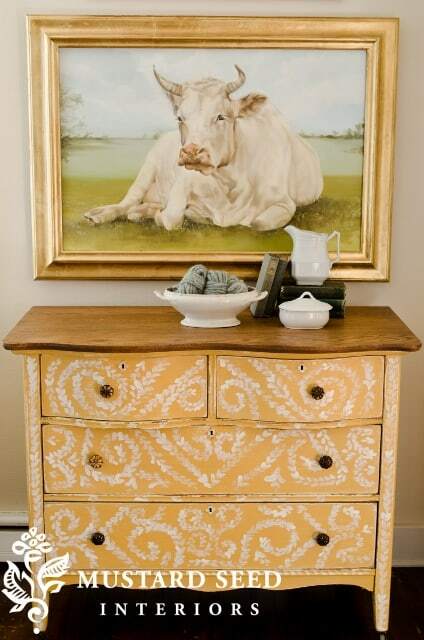 Between the cows and the dresser, I’m in love.